With the help of Tim Owens and Hippiehosting.org, York College is for the first time starting a semester of ds106 with every single student up with their own domain in the FIRST WEEK! It’s hard to describe how great this has been as in typical semesters I have at least ten or so students out of forty that seem to not sort out their domain issues until the third or fourth week. So now the focus can be more on overcoming the early learning curves associated with understanding the daily create, aggregation, embedding images, hyperlinking, commenting, and the many aspects of web writing to be discovered in this class. So this first week I thought I’d be a good ds106 student/instructor and summarize my daily creates for the week. The Daily Create as described on the ct101.us site is meant to be a simple creative exercise. You follow the prompt’s request to make something and post it to the particular space described. This usually entails posting something to your own account on Flickr, Youtube, or Soundcloud. Or in the case of a writing assignment you post directly to the the dailycreate site. Last Monday on the first day of class the daily create asked you to, “Make a blue screen of death message using type only.” Those unfamiliar with the Windows BSOD (are lucky) and could find examples doing a simple search. 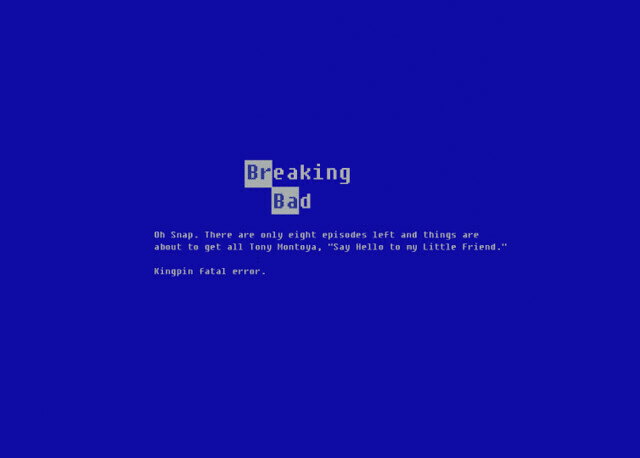 System failures are annoying, and somehow I got Breaking Bad’s final season on the brain. Walter’s ability to dodge all his pursuers appears to be coming to an end, and there will likely be a blaze of glory scene somewhere in the final eight episodes. Hence the ‘say hello to my little friend’ idea. The next day’s ‘Draw a picture of a new invention‘ did not come quickly, but at a certain point I got the idea of using a dry erase marker to draw on my office window. I tried a few different markers, but they were all too spent. I finally was able to get my hands on a new marker. Drawing with it was still unsatisfying leaving too faint an image. So I decided to bust open the marker and experiment with the filament inside. Squeezing out the marker ink while drawing proved hard to control, but led to some great textures. 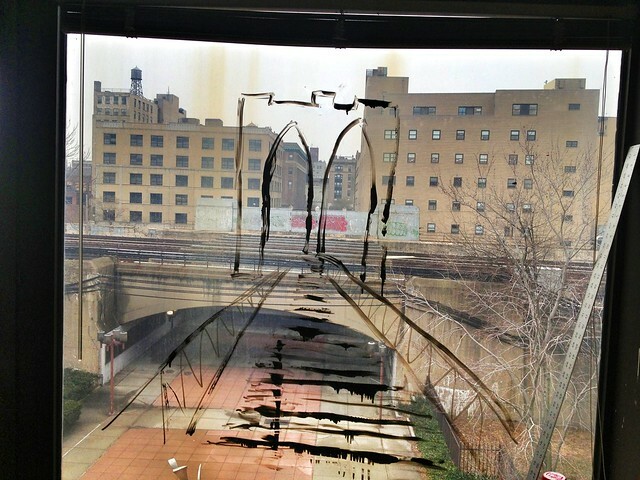 The invention was as much how to draw thick dry erase lines as much as the bridge from my office to the LIRR. On the third day, a daily create writing exercise asked that you to, ‘Finish the sentence, “My biggest fear is…” What is the story of overcoming this?‘ I actually hadn’t ever done a writing exercise on the tdc and noticed this is the only type that has you submit your response directly on the site. It was a mixture of parenting and professional fears, but you should read it yourself. And the last daily create I completed last week, which happened to be four days in a row was the photography prompt, ‘Take/make a photo that represents math at work in the world.‘ This one took sometime to figure out. I had measuring on the brain for most of the day when I thought about this assignment. I actually took a few photos of an old slide ruler that I have in my house but wasn’t satisfied. 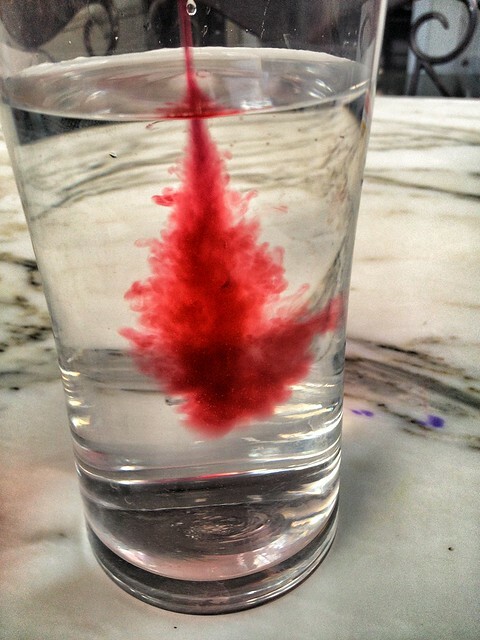 But while sitting in my kitchen with my kids, I caught a glimpse of a big glass of water and thought, ‘I wonder if I could get a photo of two different fluids come together in a glass right at the moment when they first come together, before they are mixed completely.’ The photo definitely gets at that moment, though it definitely looks a little gross. And looking forward to week two.